I love those trees, they are my favourite. Your pictures are really romantic, I like them. These photos are beautiful, what a gorgeous/stylish couple you are. Aw, thanks so much for that. So pretty! 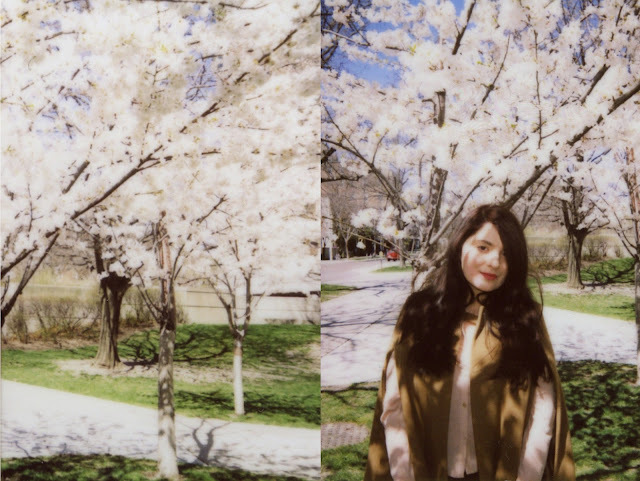 Love the dreamy quality that the Instax lends. I'm living vicariously through you right now (missing all the blooms). Hoping to get out to High Park tomorrow with Elodie. It really does, doesn't it? I love the tones and the softness. This post is magic! Ahh! so dreamy! instax is perfect for this. I think so too! I think I like the Instax pictures better than the ones that I took with my other camera. Wow these really make me want to bring out my long forgotten Instax. Beautiful! Oh yes! Such a fun camera. these are great! looks like a beautiful day over there. such lovely pictures! and your scarf collection is AMAZING!!! 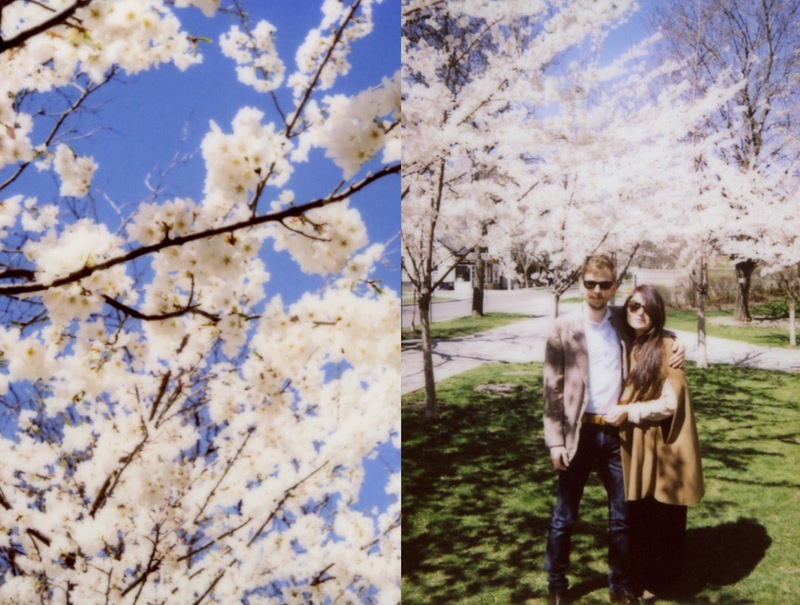 These photos are so dreamy. I love cherry blossom trees! Wish we had some around here that I could visit. It is so nice to have them. I had a cherry tree in my backyard growing up so cherry blossoms will always be pretty special to me. These are such beautiful photos. The flowers are amazing! Thank you! And yes, I agree, they are such beautiful flowers. so magical, anabela! i can't wait to visit high park soon!!! Yes! They should be in bloom in the next few days. It's very exciting. Thank you! I like the ice cave very much myself. These are so beautiful. I've got an instant camera which is sitting unused, I think I need to give it a go again! I love the light as a feather collection, the prints are amazing. Thank you. And yes, use it! Instant cameras are so fun. I personally love taking pictures of people who hate having their picture taken because usually they're happy with how they look on instant film. such pretty photos, the colors are so lovely! Thanks, babe! And yes, I only wear THE BEST sunglasses. Wink! Cherry blossom make me happy too! 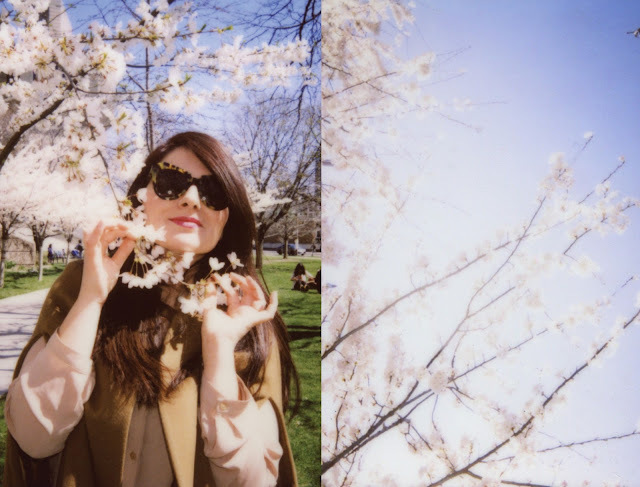 i'm really starting to warm up to the instax colours...they're so dreamy! especially in the shots you've posted here. <3! I really love the Instax tones! you guys are so dreamy. Only you could make Robarts look so romantic! perfection! 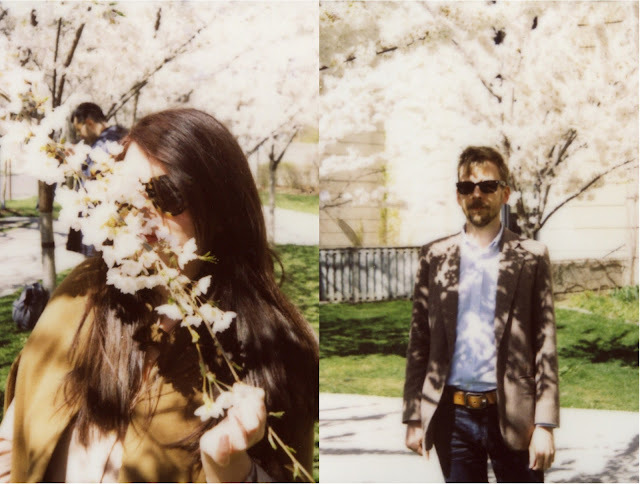 such sweet blossoms and such sweet people pictured! the quality of these photos is so smooth! i want to eat them! Aw, girl. Thank you! And yeah, I just love that dang Instax film! It is so forgiving. These are perfect! And I want Geoff's outfit for days for me. He is such a good dresser! I wish his clothes could fit me, haha. I love the cherry blossom backdrop, these are beautiful! Thank you! It's so nice to have these since the blossoms have all blown away. I love these photos so much. They are so so pretty and what a beautiful backdrop with all the gorgeous cherry blossoms! Cherry blossoms are my favorite, I love these pictures! These pics are just lovely.